Add complex notes to drinks and dishes with this sophisticated but easy-to-use smoker. Savor a smoked Bloody Mary for brunch or make your own smoked gouda for a cozy cocktail party. This sophisticated but easy-to-use system lets you add complex, smoky notes to drinks and dishes at home. Fill the gun with the included applewood chips and smoke food directly for a light, flavorful finishing touch. For a deeper infusion (smoked mac and cheese, anyone? ), use the hose attachment. You can experiment with this secret weapon by trying different types of wood, dried herbs, and spices. Even when not in use, the glass cloche and rich black walnut base make an impressive addition to your kitchen or bar. 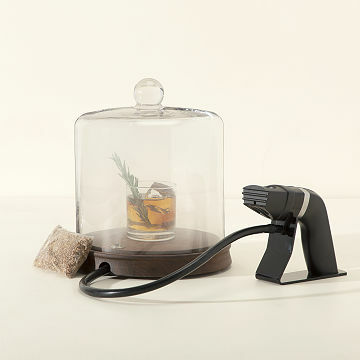 It's a distinctive gift for creative mixologists and adventurous farm-to-table fans. Made in China. Discover our 5 five favorite smoky cocktails here! Hand wash glass cloche and wipe wood base with damp cloth. Remove ashes from handheld smoker and brush clean. My husband and his friend are in love! Best cocktails ever. Makes guy night at the house elevated. All of his friends are now wanting one. Make sure to practice a few times. Once you get the hang of it -this devise will be a staple every weekend or even during the weekdays! My husband enjoys making prohibition-style craft cocktails, and the smoker takes his talents to a higher level. I would by this 10x over! Husband is obsessed with making his drinks taste more amazing each time. This has perfected his drink recipes and is a guest entertainment piece in our house! This smoker is compact, easy to use and efficient. LOVE IT. I am super excited for my husband to use this because it is portable and it's going to be easy to use..